GOLD FEATHERS. ADVENTURES, INSPIRATION, AND OTHER LOVELY THINGS. : me as foofa. i mentioned this before...it turned out so awesome! here is foofa's commercial for the new yo gabba gabba vans shoes children's line. how rad is the bike? 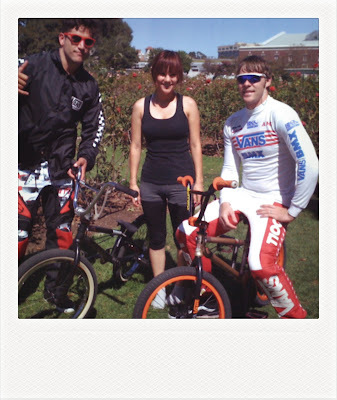 and here's a bad photo of me with the pro bmx riders from the vans team. a prime example of why you don't photograph people in the sun in the middle of the day. but it was so fun and i love how it turned out! the yo gabba gabba team is so RAD! seriously, the most creative people i know. i hope they never stop creating. also a new episode called "fairy tale" is premiering tomorrow at 11:30 am so be ready! i've seen it and it's super cool! watch it! Cute video! I'm impressed with your moves on the bike! That's so so so awesome! You did great!! That is great! I used your video on my blog for grad school! I'm doing a fan project on Yo Gabba Gabba. Thanks for being so awesome! Oh my gosh, that was you?!! I saw this commercial a few weeks ago and was LOOOOOVing it! I had no clue that was you and not some major BMX rider in there! You are amazing! Get it done girl!! day before thanksgiving kitchen activity. recipe for a perfect sunday morning. my DIY owl costume & halloween at the ace!